What I Would Do If I Ran JC Penney? Home/Blog/What I Would Do If I Ran JC Penney? Dan Alcorn sent me an article by Steven Rosenbaum, If I Were the CEO of Best Buy, and it made me start to think. What would I do if I ran JC Penney? The premise of the book is timeless–don’t compete, innovate! Their prime example is Cirque du Soleil who describe themselves as dramatic mix of circus arts and street entertainment. Despite the use of the word “cirque,” which means “circus,” Cirque du Soleil in no way looks or smells like a circus! They changed the name and changed the game. Instead of doing one better than the competition, they changed the value proposition. Many companies look to see how to “one up” their competitors hoping to gain a competitive advantage. 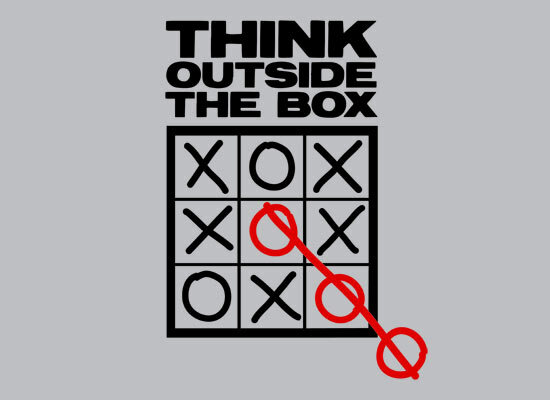 To gain a competitive advantage a business must actually do something different and thus the expression, “think outside the box.” The expression goes back to the 60/70s; that’s why you find it so nauseating. The management gurus who exhorted trainees to think outside the box made their point by resurrecting the old “Nine Dots Puzzle” as a test. If you’ve never done the test, give it a try. Jeff Bezos, the co-founder and CEO of Amazon has the greatest statement of all, his line: “Why focus on your competition, they won’t give you any money!” If I were in retail I would repeat this over and over every morning. Okay so what to do with JC Penney. Get really different. Find new designers, preferable from out of the United States. They’ve gone to Canada but I think I would go to the orient–things are really different there. Too different? Go back to the old way of selling. In the 80’s I managed saleswomen in a high end dress shop in Washington, D.C. They were on commission, spiffs and everything else! They were the old time saleswomen–they took your name, phone and knew what you liked. Anytime a product came in that “looks like you darling” the customer received a phone call. It was called service and it put money in everyone’s pocket. They never forgot your birthday, anniversary or your dress size. Her clothes and soaps aren’t expensive but everything is hand made and there’s a waiting list for the trip. Get the vendors involved. If we’re going to have Yoga classes why not have famous teachers and a Yoga master teach “special” classes.” I have a friend that owns a marina and she has Yoga on the pier. How about a masseuse, once a week, Tai Chi or Reflexology? Everything is about fitness, why not some competition and nutrition classes? Work the social media. Yoga, Pilate’s, juice bars; this makes great conversation for Facebook. Baby sitting? Why not daycare; okay so it’s not new and IKEA has the best in the country. I don’t know any retailers besides IKEA that has a daycare center. No, we don’t have to serve Swedish meatballs. Everything should revolve around creating amazing experiences for the customer so they will never shop anywhere else. They will also tell their freinds not to shop anywhere else. Isn’t this what every store is looking to create? Lisbeth Calandrino helps businesses develop loyal relationships with their customers through customer service and sales training. To have her speak at your company she can be reached at redhotcustomerservice@nycap.rr.com.